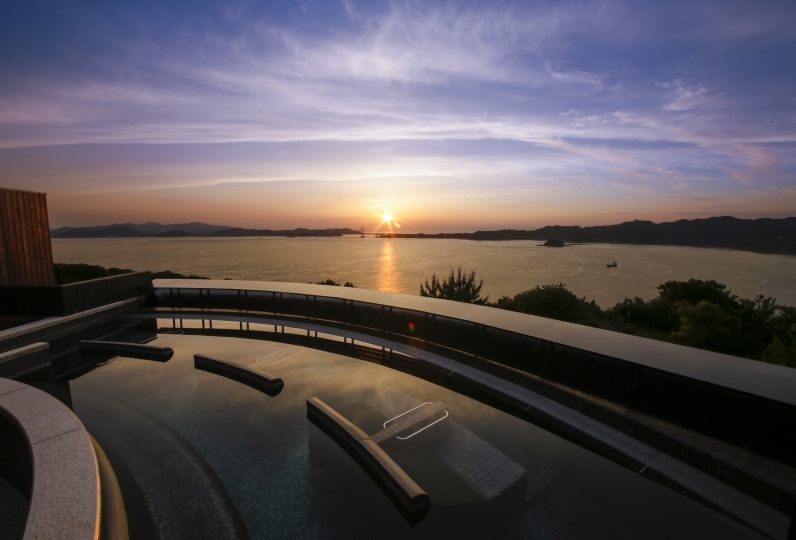 among Japan's top 100 Sunset Spots, Awaji Hamarikyu is a vintage Western-Japanese resort. It features the classic architecture from the Meiji and Taisho eras of early modern Japan. Mentioned in the ancient Manyoshu poetry chronicles the eternal beauty of this area has entranced travelers for hundreds of years. The delicacies of Awajishima's sea have long been found on the Emperor's table. Its reputation as a gourmet paradise is well-known in Japan. Awajishima also boasts a farming culture that brings the best of  local seasonal ingredients to the table. Shiozaki Onsen, a natural spa, lies in the southern part of the island. Its warm waters has the power to soothe the skin and heal the body. 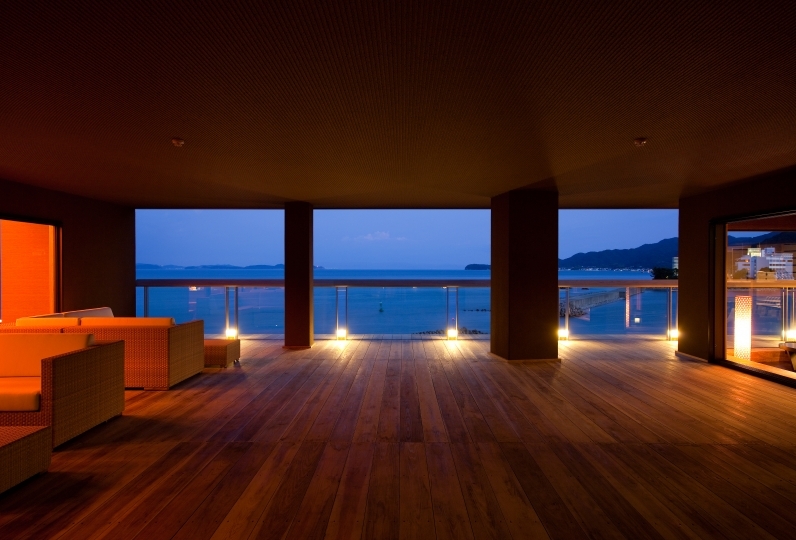 Guests who stay at Awaji Hamarikyu will find a quiet and relaxing sanctuary. Great hotel, nice staff, excellent food. It was perfect! 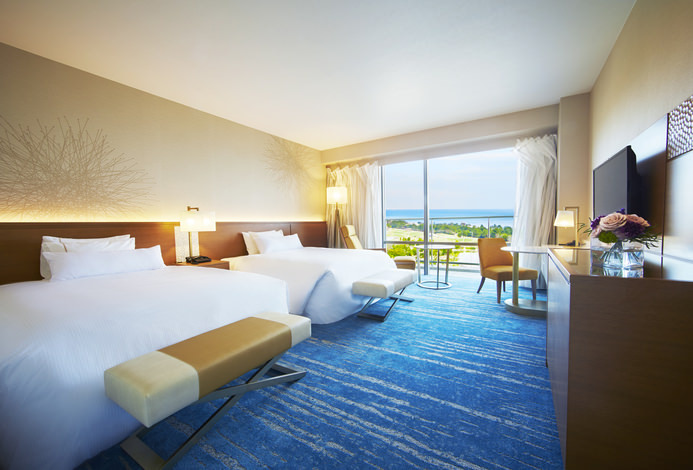 How is the cospa for accommodation expenses? ? Well there may not be a hotel? ? If there is no discount, When it comes to cooking, the structure is unique, and only a small amount of meat? ? I ordered cold sake, put it at room temperature, put it on ice, and it's cold wine later, but keep the first person warm! ! Service was polite and good! ! *The sunset announces that dinner is about to begin. 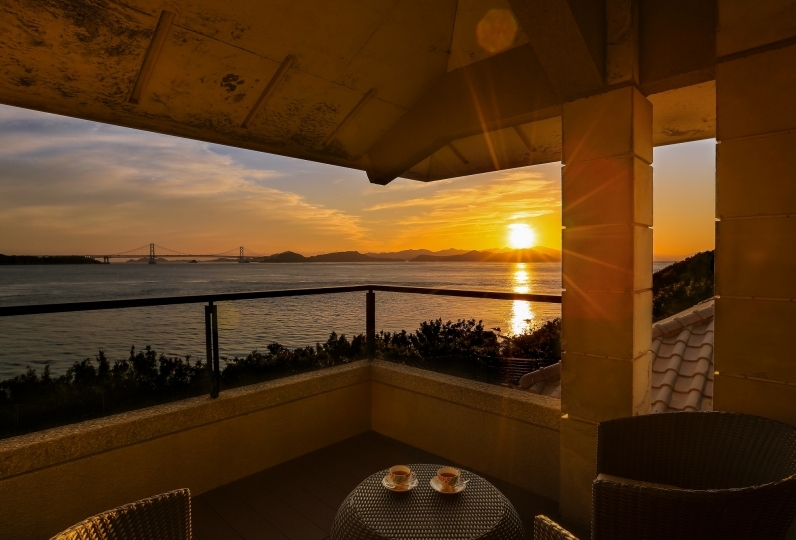 Before your eyes is the beautiful sea of Awajishima, which has provided the fishermen with plenty of bounties from nature since ancient times. It features seafood delivered from local fishing ports, locally-grown vegetables, and Awaji wagyu beef. The dishes made using selected ingredients from Awajishima will last in your memory. Aratan's dining room is a classical style with a high ceiling and a brilliant carpet with the color of sunset. A view of the beach at sunset can be enjoyed from the restaurant. Table seating, counter seating, and private dining rooms are available. Enjoy nostalgic dining room with stained glass windows and chandeliers. A breakfast buffet featuring both Japanese and Western-style dishes will be available in the dining hall. Terrace seating is available. *Hot spring communal spa "Niwa no Yu" [6:00am〜10:30am/12:30pm〜12:00am]#The bath is closed from 10:30am to 12:30pm for maintenance. Minami Awaji Onsen Village is known for　hot springs with distinct water qualities. 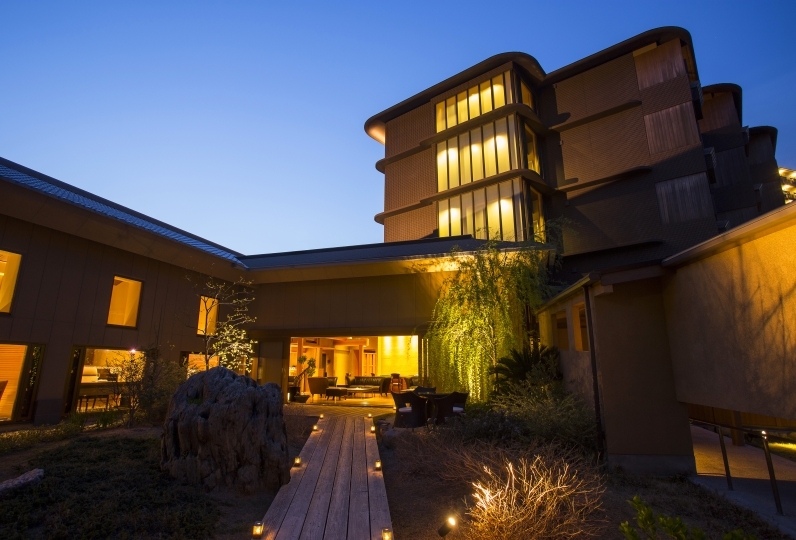 Shiozaki Onsen is an alkaline hot spring effective for soothing tired muscles. A view of a small garden can be seen from the relaxing communal spa. Enjoy the silky natural hot spring water. 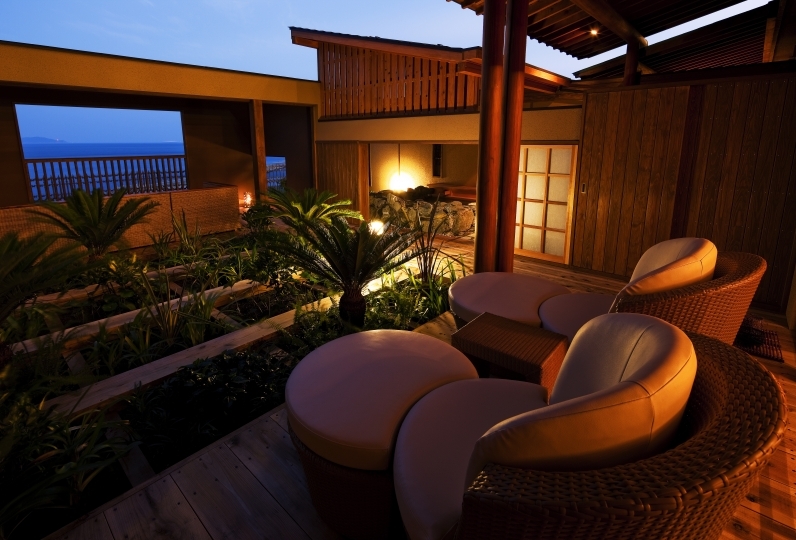 Relax with a cup of chilled green tea on the balcony seats after your bath or to simply watch the pines, the beach, and the sea. Herbal tea and seasonal fruit juices offered during the daytime. House wine and various alcoholic beverages in the evenings. Food items using Awaji Onions, seafood, local sake and beer. Perfect for relaxing with a book and a drink from the library lounge in the mornings, during the day, and in the evenings. Also you can go for a walk on the beach directly from the terrace. Books, coffee, and various beverages. Meditation, massage, and breathing methods are a part of the treatments. All treatments are administered by hand. *Spa entrance fee (150 yen) not included. *We will come pick you up if you call the hotel（0799-22-2521) after you arrive at Riku-no-minato Seidan or Seidan-shichi. *Please wait at the bus stops for the shuttles at the stations. *from Riku-no-minato Seidan and from Seidan-shichi, the trip to the hotel will take 7 minutes. *For guests who are planning to use a car navigation system. Regarding certain car navigation systems, if the hotel's phone number (0799-36-3111) is used to search the route, a wrong destination may be shown. If "Awaji Hamarikyu" is not the name of your destination, please search for a route again by inputting the following address.